Many, many thanks for an excellent product. Besides removing stubborn laundry stains, the stain remover affords me more time for other tasks. It quickly and efficiently cleans my bath, basins, shower recess (glass), toilets, stainless steel sinks and benches etc, quicker better and greater (no fumes!) than many other products. In fact the best so far. I’m more that satisfied! I think my wash balls are fantastic as I have a teenage boy who was covered in psoriasis from head to toe, a fortnight before Xmas he had been sick of living and was extremely depressed, he was under sever treatment from the hospital and not able to work, but since using wash balls his skin is 80% cleared and only using his hospital medication a couple of times a week in the very odd spots, so at this stage I’m truly glad I picked up a magazine with your advert in as I have a much happier boy who now enjoys life again and back at work. I also put my sister on to them as she is covered in psoriasis as well. I have been using my miracle wash laundry balls for almost a year now and I use nothing else. I am thrilled with the results. Not only are my clothes softer but I am also rash free. I couldn’t be happier with your wonderful product. 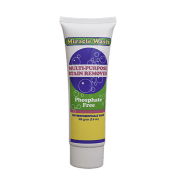 My family have loved the gift of Miracle Wash and I constantly spread the good word. So far we are mighty pleased and impressed with the result from your Balls. We had no idea how much softer our clothes would feel nor how much cleaner they would smell without Detergent use. “I have been thrilled with the Laundry Balls. I find I am saving on electricity, water and not forgetting the environment. “I am very happy with the laundry balls and find that my clothes are so much nicer and softer. But the main reason I am happy with them is the water I am saving. As I only need to wash and not rinse, for every wash I am saving one machine full of water, Wow!! Water is very precious here so it is great. ‘My husband has suffered severe rashes all over his body over many years and has doctors puzzled after subscribing cortisone creams mixed with other soothing creams but nothing has helped. Some nights he can’t sleep as the itch is so bad. I am amazed since using the laundry balls just twice and making sure he uses those clothes I’ve wash with the laundry balls his rash has almost gone and I’m sure will completely vanish when I have wash all his clothes from the wardrobe and bathroom. “These balls are amazing. I was skeptical but wouldn’t use anything else now. “I was at a friend’s place picking mulberries in one of my favourite shirts. You guessed it—I got mulberry stains on it. We immediately soaked it in conventional detergent, including hand-scrubbing, but to no avail…the familiar blue stains were there to stay. “I am enjoying washing with the balls, and everything is so fresh and soft. I feel quite smug that I am helping the environment and saving money too. The ironing even seems to be easier ! “I just wanted to thank you for the Laundry Balls – they’re fabulous. I love them because they’re better for my family and the environment, but the best surprise I got was that my towels are now soft! After over a year of not using fabric softener they were starting to feel like cardboard and now they soft and fluffy! ‘ I have been meaning to write to you for some time, but busy busy. My whites are whiter than they have ever been, and my coloureds are just fine. As an example, underwear that I took backpacking around Europe for 12 months and which was more often than not washed with me under the shower resulting in a very noticeable grey shade of white, are now almost white again. I can tell this because some of these items were washed with the laundry balls regularly for about four months while the others stayed in storage. The difference was somewhat startling when I compared the two. I love the feel that the soap suds are no longer left in my washing and they feel softer. I’m saving water & time as well. Since adding some bicarb to my wash it looks even brighter. Just a note to let you know that I love using the wash balls. It’s fantastic to know that I am using a product that is better for my health and that of the environment. For my last holiday it was so easy to just throw the wash balls into the suitcase and know I wouldn’t have to bother buying laundry powder at the other end. Everyone should use these – so convenient and economical and provided with such great customer service – all our garments have come up beautifully – my husband still can’t believe how easy it has become to do the washing. Thanks for this wonderful product. ‘ My son developed blisters on his hands when he was only a couple of weeks old and these eventually spread over his body. They were diagnosed as a form of eczema which was extremely itchy. We tried different infant formulas and different sensitive washing powders none of these seemed to make any difference. I was told about your laundry ball site and decided it sounded amazing and I had nothing to lose so I purchased a set and have never looked back. Gradually as all the detergents washed out of our clothes and linen his eczema began clearing up. We were sure it was a result of the laundry balls but were asked if it was just a coincidence that it began clearing up at that time. We proved it was a result of the laundry balls when I was unable to use my balls for a week, the blisters began returning within a couple of days and disappeared just as quickly when I returned to using the balls. I am completely happy with the laundry balls that I have been using for some months. Only this week I came home from a trip to the North West with clothes naturally with red dust on them and thought this will be a good test for the Laundry Ball. I can assure you it came through with flying colours (excuse the pun – not intended!!) – all clothes came out clean and no sign of any red dust residue. ‘I used the miracle balls for the first time on the weekend and I was completely amazed. Thank you for a marvellous product. We live in South East Qld and are in the grip of a terrible drought with even more threats of harsher water restrictions to come. I bucket out all my washing machine water to water my much loved garden and I now don’t have to worry about what goes out on it thanks to your great product. I would recommend them to anyone! I love that my clothes have no scent at all (no more headaches), and that I can put my hands in the water to stir the clothes around without getting chemicals on my skin (no more skin rashes), and that I can use all of my laundry water on my garden (no more waste). …By the way, I love using the balls. Washing is so much easier and quicker and cheaper now. Thanks very much! ‘Hi, the laundry balls are fabulous. have cleaned my washing machine pre use of balls but still haven’t got a spray bottle to make up the solution for extra cleaning which I do need as I have 2 small children boys who are out door boys and end up with grubby marks on all their clothes. I just fill the machine up with water each day and put the clothes in as I go. ‘Just letting you know how we found the Laundry balls, very good. They are wonderful I never scratch my skin any more , so I must have allergic to what I was using before. My husband would buy the detergent so I would use what we had on the shelf. I have told so many people about the Laundry balls so my niece has start using them now, also she got the 3 pack and she gave one to her mum and one to her sister. My niece said she does not get any allergies any more. So we are both very happy with the Laundry balls also I found the Multi stain remover very good I even clean my canvas shoes with it. Over all I could not be happier I am so happy I read it in the Sunday Times going back 6 months ago. with the clean, fresh and soft wash we are achieving with Miracle Wash Laundry Balls. “I think the laundry balls are a great product: it has cut our water usage dramatically which is a bonus, as well as doing the job – getting the clothes clean – and very cheaply!! “I am thrilled with my washing balls. I had to wash my husband’s work clothes in cold water the other day and they still came out pretty clean. As we live in the bush, water is a precious commodity, so not having to rinse is a wonderful feature. “Oh my gosh am I enjoying my balls……Laundry ones of course! I have 3 dirty boys living with me, and one in particular ( the older one by 30 years) is well renowned for dropping food down his shirts. He has noticed that a sticky stain that has been on his beloved Holden jumper has disappeared after being there for over a year. My friend and I also searched his work shirts for a greasy stain that he had on his work shirt for 4 weeks( brand new one I might add) and it is gone. I just read the information sheet that came with my balls with my friend while I was referring her and discovered the bit about cleaning my machine so I have that on my list this weekend. The other bit about the stain remover….well I haven’t even needed it yet. I could however try it out on my other dirty boys socks, which I am sure he walks home from school through the mud with no shoes on…. just socks. I am so happy that my youngest stinky kid ( who has allergies to allergies) and myself are not itching from the washing powder and now I am off to do a soap making class to eliminate SLS from our house more. poultry farmers with two preschool boys and get pretty dirty, so that’s saying something. I am very happy with the product and will be recommending it. I love your product. It has made a huge difference to my kids skin, and I love that I am reducing my water bill at the same time! 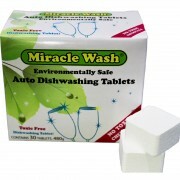 so I was very excited to find out about Miracle Wash and the dishwashing balls. I have used the Laundry Balls on all of our washing with a fantastic result. They work just as well on the most delicate items, children’s clothing and even my farming husband’s dirty, greasy, smelly work wear. I was a little sceptical at first as I was the sort of person who loved the smell of washing powder on my clothes getting them off the washing line. When I found out that if you could smell the powder on your clothes you were using too much, I decided I would give Laundry Balls a go. I love them, they are great for our environment and for the health of our families and best of all they really do work. I also use the dishwashing ball and you can really taste the difference. No more bubbly cups or glasses and all you are left with are sparkling clean dishes with very little effort required. 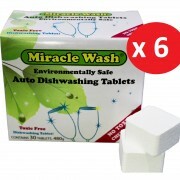 “I tried the Miracle Wash Laundry Ball Kit and was impressed and amazed it got the job done. The bonus being, the balls are environmentally friendly. We all lead pretty hectic lives these days so having something like the laundry balls is great as they help us in both time and money. Just throw them in the washing machine. No measuring out detergent, no effort required. I almost enjoy washing now. When I go away on holidays I like to take my washing powder which can be a little messy due to spillage. With the laundry balls, there is no spillage, no fuss. ‘Thank you so much for introducing me to the Laundry Balls. They are fantastic in that I no longer have to deal with messy liquids and powders – no sneezing or irritable skin! It took about 3 weeks ( I wash 2-3 times a week) for the clothes to come out lint stain free. Prior to Laundry Balls, after each wash I had to rinse lint marks off certain clothes before hanging them on the line. I also like the faint fresh smell to the clothes – it is very subtle. My husband is in the building industry and his clothes come out clean without extra cleansers added to the wash. My massage towels are also coming out clean. I have passed them around the family and they also love them, so I will be ordering more very soon. Thank you for my discount and free freight on my last order. 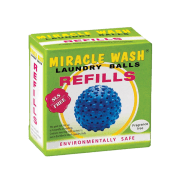 “I came upon an advertisement in our local paper, near Xmas time, for Miracle Wash Laundry Balls, and as my daughter-in-law is very enviro friendly and a great nature lover, I was able to give her a Laundry Ball Starter kit for Xmas. She was so happy with it I also decided to give it a try and am astonished with the results of my own washing. “Thanks for the new ball and the stain remover. I think your customer service is absolutely first class and I hope your business is doing really well. “I want to let you know that I really love the Laundry balls. I have found that our clothes have been much softer and nicer, especially after being washed several times with the laundry balls, as the residue from previous washing detergents leaves the clothes. I have also had excellent success with washing cloth nappies. ” I have been using the laundry balls for just over 3 weeks now and I love them. They are so easy to use – no messing around with dripping liquids or powders that go everywhere. I have found they wash my clothes even better than my current liquid (Omo) and the clothes smell nice and clean without that chemical smell. I have also used the stain removed to get grease of my husband’s shirt and it worked a treat. I have just received my laundry kit from you and I must say I am very excited with the quality of the wash.
As you know the quantity of washing I generate at the Bed and Breakfast is substantial and being conscious of living in an environmentally sensitive area and being on septic tanks I am thrilled with the results. I have just completed the linen washing from a full house this weekend and know that I have had just a superior wash from using the laundry ball as I did using commercial laundry powder. I have always been concerned about the quantity of chemical I have been using when washing and now I can complete my laundry without any of those concerns. I am now fully convinced and will continue using this amazing little ball. Just writing to tell you what a great product your Laundry Balls are and to thank you for my order. I have my washing done in no time flat now and everything is clean and fresh. I am totally sold on your product, and I will be looking forward to a reduced water bill this summer, I love the stain remover too. I have more time now to do all the things I love doing, especially searching on the internet and reading my emails which is how I found out about your wonderful product in the first place. I received the laundry balls a few weeks ago, thankyou very much. I have been using the laundry balls for about 3 weeks now and they are great. My son’s nappies are coming out cleaner, and this was the ultimate test. All of our clothes are coming out as clean, if not cleaner now. We have saved hundreds of litres of water and we don’t have to worry about salt build up on our garden if we use the water. Also, when assessing the cleanliness of our clothes after using the balls I was much more observant and fussy – they passed the test every time! Also, I am spreading the word here about how great they are. “I Love Them! Not only can I get through loads of washing quicker (Saving Time, Money and water) my clothes do feel softer. ‘I have just done my first wash with the new laundry balls and just love the result! It took me around 2 hours to give my washing machine a really good clean beforehand (shows what a lazy person I am and how disgusting the powders make your machine!). Even using the stain remover (in a water bottle) was lovely, not having to inhale all those nasty smells. So far, I am very impressed with firstly, the money I will save on powder (I buy in bulk and costs me +$60 every 3 months) and secondly water (my machine fills up 3 times – 2 rinse cycles). Already I have spread the gospel!! I am absolutely delighted that I found the Miracle Wash laundry balls and tell everyone that will listen about them. And I have already converted a few friends! I think that the balls are really effective, economical, hassle free and best of all are ‘nasty’ chemical free! I’ve also had great success with the stain remover. I mostly use it diluted with water, as you suggested. Recently, I sprayed a white beanie with the diluted stain stain remover and placed the beanie in a bucket with one of the Miracle Wash laundry balls and a little bi-carb soda and I was thrilled with the result – a beautiful white beanie without the nasty chemical smell! I have always hated the smell of laundry detergents and powders – even as a teenager I hated the smell. So for many years I’ve been using a supposedly gentle liquid laundry detergent without any nasty odour. But recently I realised that it contained nasty chemicals that I am no longer happy to use. So Miracle Wash laundry balls are here to stay in my house! “It has now been 2 months since we swapped our laundry detergent for ‘Miracle Wash Laundry Balls’ so I thought I’d write to let you know how we’re getting on. Being the busiest Veterinary Clinic in Perth, we naturally have loads of dirty washing – 6-10 loads per day in our heavy duty Cleanmaid washing machine. We wash sheets, towels, blankets and surgical drapes which can be soiled with any combination of urine, faeces (including diarrhoea), vomit, blood, pus. Yuk, yuk, yuk. We were very surprised to find that everything came out clean! When washing the surgical drapes (prior to sterilizing them) we add a small amount of the ‘stain remover’ to the machine to help remover blood stains. Because we do so many wash loads per say, I decided that we should use 2 laundry ball Kits, alternating them, so that the Laundry Balls can dry out between washes. We’ve saved heaps of $’s. All our nurses (except one) now use the Laundry Balls at home too. We (the Vet and I) also use the Laundry Balls at home. We have a cattle farm in the Southwest where we also use the laundry balls. Our ‘ farm’ washing is always very dirty; cow poo, tractor grease, dirt; no problem for our Laundry Balls! Many thanks Dana. We love anything that helps save our environment. The less chemicals we have to use the better! I use castor oil for massaging aches and pains on my family. It cools down the inflammation. In order for the oil to do its work, it is best to leave the oil on overnight. As a result, the sheets do get stained. I have used ordinary washing powder and am not able to remove these stains. I used your stain remover and left it on for a few hours before washing. I was delighted that the oil is no longer there. Also, some of my clothes attract a lot of lint during the wash. To my joy these clothes came out lint free. I am absolutely delighted! know that I am absolutely thrilled to bits with the results. My washing is so soft and clean, and of course the saving on soap powders and softeners goes without saying; also the water and time saved are amazing. I will sing the praises to everyone I know. Just a quick note to let you know how happy I am with my Laundry Balls. I have to admit that I was a little skeptical at first, especially since I was about to embark on the use of cloth nappies for my then unborn child. My little boy, Xavier, has now arrived (he is now four weeks old) and I have been thrilled with the results that I have been able to achieve using only the stain remover (a squirt before dry pailing), the laundry balls and white vinegar in the rinse. Thank you – Laundry Balls makes the use of cloth nappies hassle free and avoids the purchase of expensive and harsh detergents.